A bitterly cold polar airmass dipped into the north central United States during the last week of January 2019. 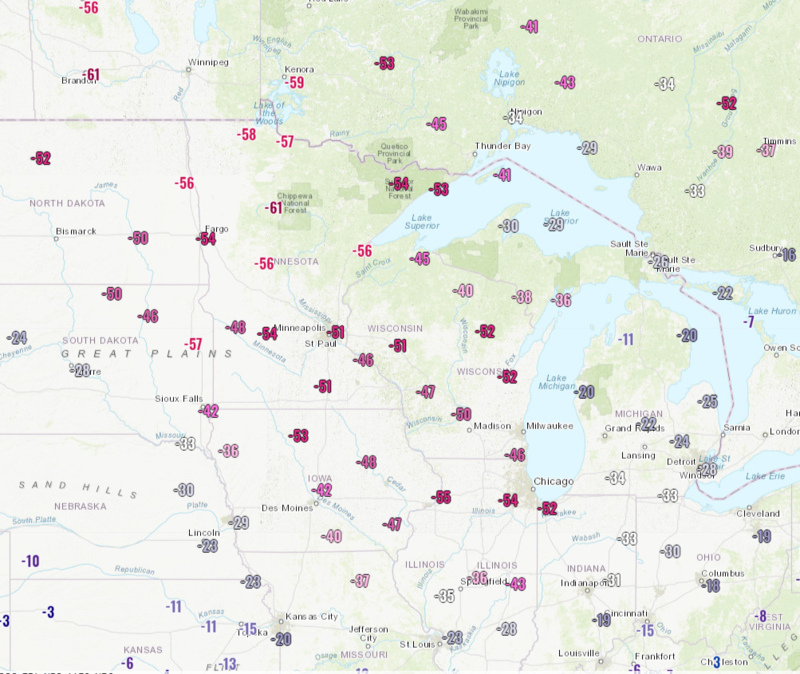 During the early morning hours of the 30th, temperatures dropped into the -20s to -30s (F) over a wide swath of the upper midwest, while daytime highs on the 30th were not expected to get out of the negative teens. With breezy northwest winds also present, wind chill values dropped below -50F in many locations (Fig 1). GOES-16 provided some intriguing views of the cold airmass as it impacted the region during the week. GOES-16 IR window imagery 15-hour animation showed the broad scope of the cold air as it expanded across the midwest during the evening of the 29th into the morning of the 30th (Fig 2). Clear-sky brightness temperatures below -30C were widespread, with values below -40C found in the Dakotas and Minnesota. These values corresponded to brightness temperatures typical of mid to upper level clouds. The GOES-16 Land Surface Temperature (LST) derived product uses GOES-16 imagery to estimate the skin temperature of the surface (Fig 2). The LST product uses the 11.2 um and 12.3 um IR ABI channels in its calculation. Temperatures below -40C were sampled across the region, with readings as low as -50C sampled just north of the border in Manitoba. 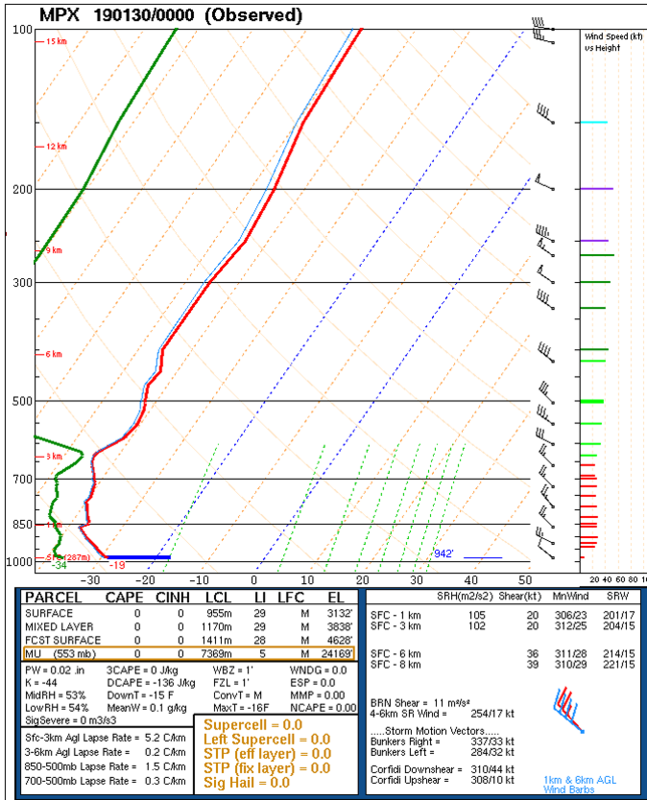 Of course, the airmass was very dry as well. The extent of the dryness is exemplified when viewing the three water vapor channels in conjunction with the 10.3 um IR channel (Fig 3). The 7.3 um (low-level) and then 6.95 um (mid-level) water vapor channels show brightness temperatures just slightly cooler than the 10.3 um IR window channel (~-40C) within the cold region, indicating they are all sensing in a similar layer of the atmosphere (near surface) and that there is a lack of moisture in the atmosphere since these moisture-sensitive channels are sensing so close to the surface. Further, surface features such as lakes and rivers are easily apparent in the 7.34 um channel, and to a lesser extent, 6.95 um. Usually, due to absorption by water vapor, these channels are sensing progressively higher in the atmosphere and are not able to detect surface features. The 6.19 um (upper level) water vapor channel is only running ~5C colder than than the other two, further demonstrating the degree of dryness in the atmosphere. Fig 5 is similar to Fig 4, but zoomed in and sampling a point near the IA/MN border. Notice the land features apparent in the IRW, LLWV, and MLWV, particularly the rivers in Illinois. Fig 5: Similar to Fig 4, but at 12Z with sampling point near IA/MN border. Another way to view the location in the atmosphere within which these channels are sensing is to analyze weighting function plots, available from CIMSS. 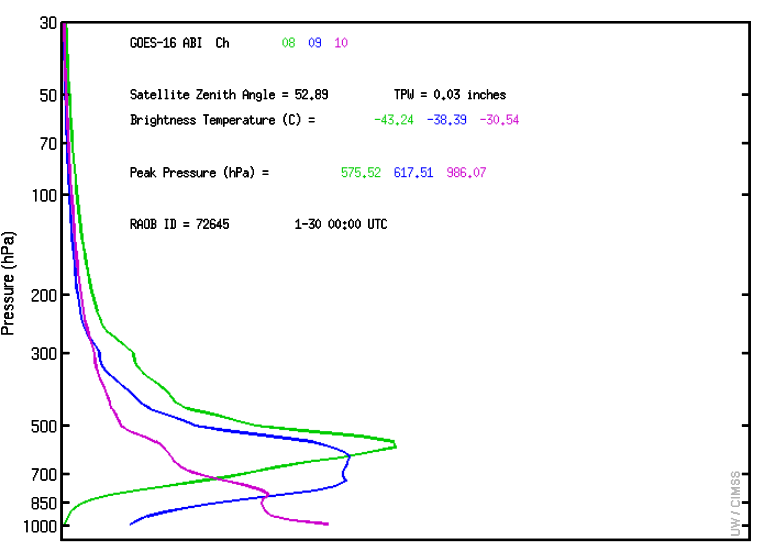 The weighting functions for the GOES-16 water vapor channels over GRB are shown in Fig 6. These soundings compare well with those from a standard midlatitude winter atmosphere with 10% column moisture (Fig 7), it is obvious that greatest contribution to these channels is coming from much lower in the atmosphere than is typical. It is also apparent that, since the weighting functions are peaking lower than normal, that the atmosphere is quite dry. In fact, the 7.34 um channel is peaking at the surface, which is not surprising considering we are seeing surface features in the imagery. The GOES-16 Total Precipitable Water (TPW) Derived product reinforces the degree of dryness, showing a wide region of values less than 0.1″ (Fig 8). 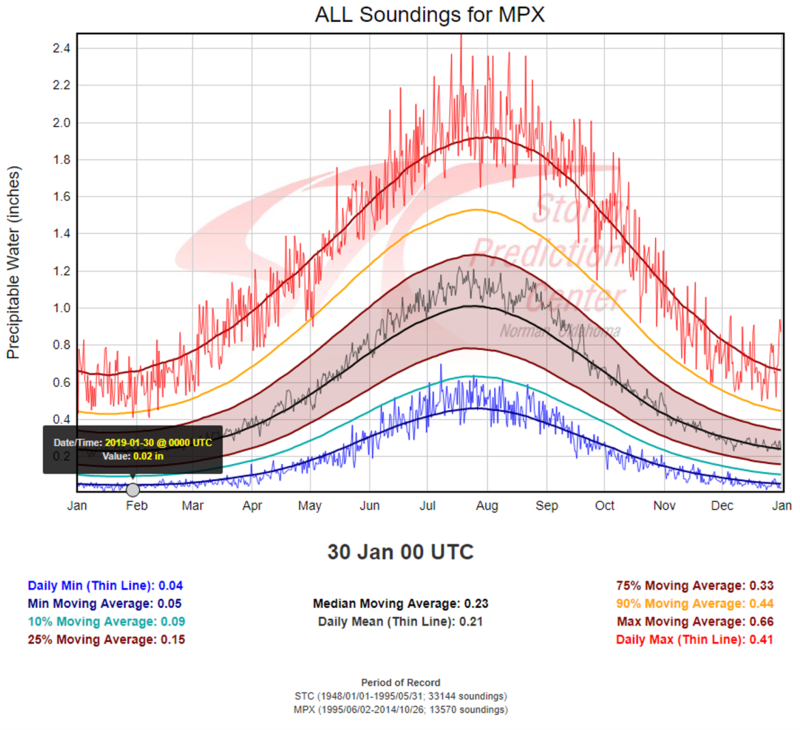 Fig 9: 00Z 30 Jan 2019 MPX sounding (left) and MPX TPW sounding climatology (right).